If you are thinking of trying out the Ketogenic diet, then you are in the right place. In this article, we are going to review the most popular Ketogenic diet books and help you pick the best one for you. Let’s start with the beginning. What exactly is a keto diet? Did you know that the keto diet was initially developed as a treatment for epilepsy before any medication was available? This was happening way back in 1921 – 1938. After that, the keto diet was forgotten, for almost 100 years. Now, it has been re-purposed into a diet with a lot more benefits than just weight loss: improved mental performance, live longer and feel better. Not many diets commit to those ambitions advantages. 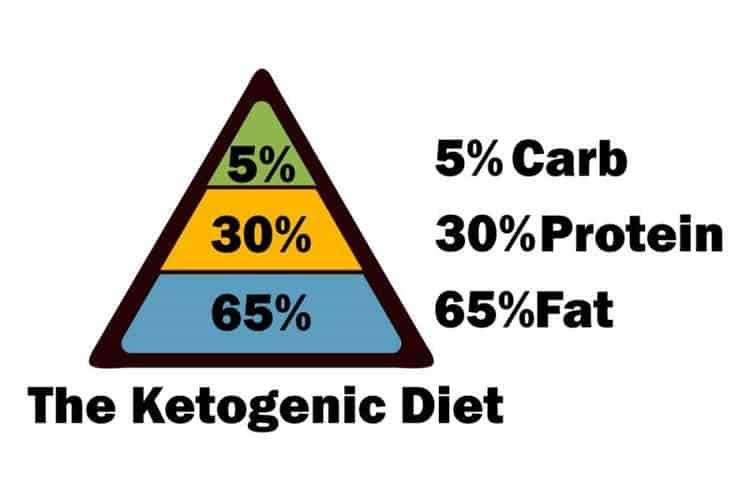 A keto type of diet will consist of high fat intake, low carb, and low protein. Generally speaking, the recommended macronutrient split is 4:1, meaning that for each gram of protein and carb you should eat 4 grams of fats. There are different variations on this split though. The most popular of the variation includes a higher protein intake while still keeping the carbs low and fats high. The purpose of the keto diet is to make your body run on ketones (by-product of fat) rather than glucose (by-product of carbs). 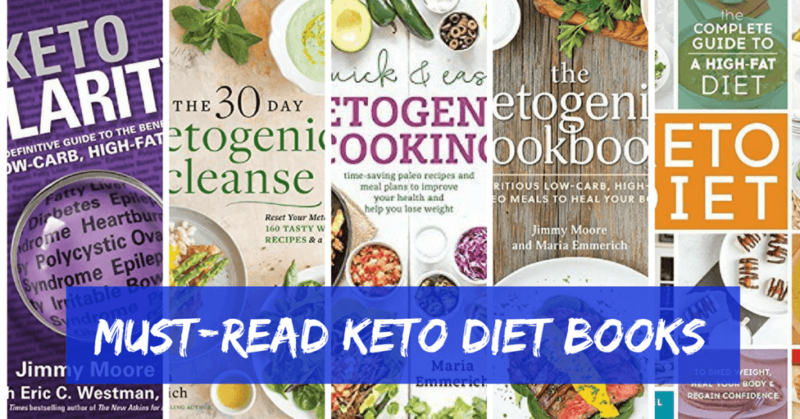 Let’s take a look at the most popular keto books and decide which one is best for you. This book by Dr. Jimmy More is probably one of the most popular keto related books. You will see the Keto Clarity name pop up a lot on many magazines, websites or forums. There are many stories of people who had a lot of success following the advice on Dr. Jimmy More’s book in a matter of weeks. However, it is recommended that you stick with the diet for at least 3 months before you decide if it a go or no go for losing weight. So if you are looking for an effective guide on how to lose weight fast using the keto diet, this might be just the product for you. The book contains a nice ‘Introduction to keto diet’ chapter which really goes into a lot of depth. This chapter also tells the story of how Dr. Jimmy More got into the diet and how he managed to overcome his weight loss struggle through keto dieting. The author also had many other physicians input in the book, which is something that we liked very much. 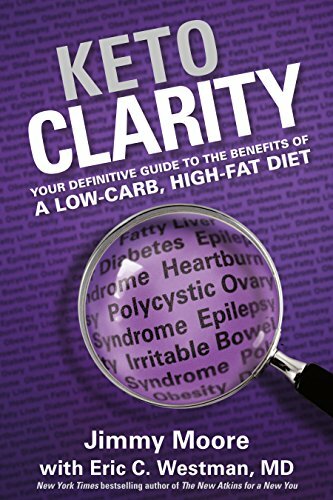 In between the paragraphs of the book, you will find small sections called ‘Moments of clarity’ which are actual quotes from many different doctors or keto specialists. I think this adds a lot of credibility behind the information presented in the book and it underlines very nicely the medical advantages of the diet. Another thing we liked about the book is that it allows you to slightly adjust the diet for you personally. You have chapters such as ‘Find your cab tolerance levels’ or ‘Determine your personal protein threshold’. In these chapters, you will learn how to lower your carb intake so that your body gets into keto mode, but also how to slightly increase carbs to a level that your body is comfortable with. And the same goes for protein intake. This is really important because you will be able to stick to it easier for long periods of time. These are the most practical and valuable chapters of the book, from an implementation point of view. Dr. Jimmy More also suggests a very unique and interesting way of combining the keto diet with intermittent fasting which is not that common in other similar products. The book contains quite a few success stories, a list of foods to shop for when dieting, and an exhaustive list of FAQ and answers. If you are about to start your keto journey this product might be just the right one for you. If you already have a solid grasp of what keto is and you want to get more advanced, the book doesn’t really add that much value. 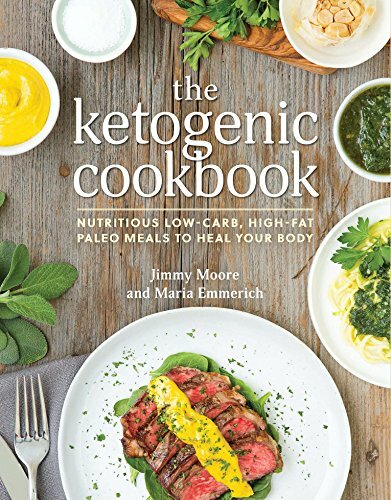 The Ketogenic Cookbook is co-authored by the same Dr. Jimmy More together with Maria Emmerich. As the name suggests it is a collection of keto recipes to get you started on the diet. However, this is not your average cookbook. All the recipes are really good, tasty and flavored. It doesn’t really feel like you are dieting at all. On top of that, all the recipes in there will pave your way to achieving optimal health, while eating good food and losing weight at the same time. The first thirty-something pages of the book are more like an introduction to keto dieting. So you will find those really helpful if you don’t know that much about keto. But if you really want to learn more subtle details about keto you will probably need to look for more information elsewhere. Turning regular recipes into low carb, low protein and high-fat meals is most of the time impossible, so getting a keto cookbook is a smart thing to do if you plan on sticking to your diet. You would be amazed at how foods such as pancakes, pizza or even bread can be turned into low-carb keto-foods. Eating foods that are not tasty or that you don’t enjoy eating are the number one thing for not following a diet. You are very unlikely to have this issue with The Ketogenic Cookbook. There is no way you cannot find recipes you will enjoy eating, no matter how picky you are about your food. Each recipe is very well explained, includes mouthwatering pictures and just amazes with how tasty diet food can be. Most of the foods in the book take as little as 5 to 10 minutes to prepare before putting them in the oven. Authored by Leanne Vogel, this is another keto diet cookbook containing more than 125 keto recipes and 5 meal plans to choose from. Leanne struggled with health and weight issues for many years, until 2014 when she discovered the keto diet. This is one of the most compelling keto books with 448 pages of packed and well-structured information. Even if you are not new to keto you will still have a lot to learn from the book. Besides the recipes, Leanne gets into a lot of detailed information about the keto diet and how it helped her overcome amenorrhea, hypothyroidism, fixing hormone levels and gaining self-confidence. You can really tell there is a real person behind the book sharing not only knowledge, but her own personal life experiences. Leanne gets very personal in the book and I believe a lot of females readers will click with her story and with the book. The Complete Guide to a High-Fat Diet has a less ‘scientific’ approach to it. This can be viewed both as an advantage – it is super easy and fun to read. 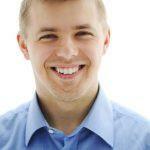 But also as a disadvantage – it might lack the credibility that other professional keto researches have behind them. The recipes are high in healthy fats and fibers, and of course low in carbs. But what differentiates it from other keto recipe books is that most recipes are also gluten-free. Another differentiator of this book is that it puts more focus on whole foods and timing carbs based on each individual’s needs or health status. So you will find recipes with different carbs amounts which you can use at different times depending on your own personal conditions. As mentioned, this book is really long so if you are just starting out with keto dieting it might be overwhelming. It would be a better decision to start off with a less in-depth book and then take it from there. On the other hand, if you want to skyrocket your keto knowledge this is could be a good read. 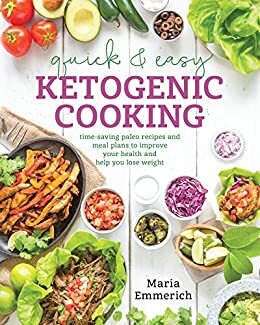 Written by Maria Emmerich this is book can be looked at as different version of ‘The Ketogenic Cookbook’. The book is full with a lot of keto diet information as well as a few charts on how much fats and proteins are in different cuts of meats. Then you also have an exhaustive chart with plants and their nutritional information. Once you get to the recipes part you will be amazed by how many brilliant ideas the book contains. You can’t really tell it’s a diet book. All the recipes are super tasty and easy to prepare. You don’t even need to be good at it and you will be able to cook delicious meals. Maria included little icons next to each recipe to flag under what category each food falls into. You have egg-free, dairy-free, vegetarian, net-free, and many, many more categories. This will make it very easy to browse through all the recipes and pick the one you want. Some of the recipes also include links to instructional videos, which are easy to follow along even if you are new at cooking your own food. They made it really simple for the reader. Though I doubt you can lose that much weight in as little as 7 days, so maybe the first meal plan is not the best approach. To make things even easier, you also get a shopping list for the 7-day meal plans. All the meal plans are based on the recipes from the book of course. Maria suggests using the left-overs from certain day the following day so you save both time and food. If you want to be super strict with your diet you can do so by tracking the calories and macros. Each recipe has the nutritional information written down at the bottom of the page. So you have no excuse for not tracking them. A little bit of a downside of the book is that for most recipes you will need ingredients which are not that common. You will need to do a little bit of shopping and some of the ingredients might be on expensive. 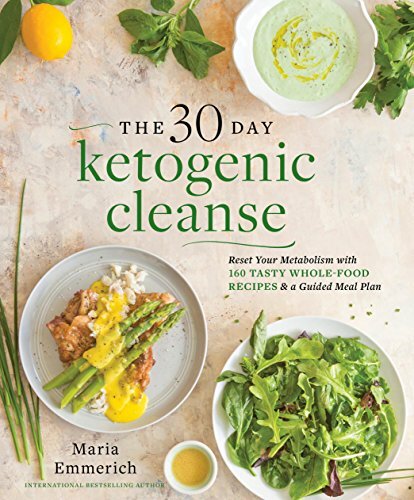 Lastly but not least, The 30-Day Ketogenic Cleanse is another popular keto book by Maria Emmerich. You can expect the same exact level of quality and detail as in the Quick & Easy Ketogenic Cooking. You will find here a lot of nut-free and dairy-free recipes. These are great if you have any kind of intolerance to these foods or if you are simply bored with the same old standard keto recipes. As the name suggests, this book is built around a 30-day meal plan which should help you get started with keto. Get ready for some serious cooking though. If you plan on following Maria’s meal plan you will spend a lot of time in the kitchen. You will need to cook 2-3 different recipes for each meal. This can be viewed as both an advantage – if you like cooking a lot, or a disadvantage – if you lack time. So, for really busy people this might be a little bit impractical do to and day to day basis. If you are in the latter category, you will probably benefit more from the recipes presented in The Ketogenic Cookbook co-authored with Dr. Jimmy More. Most of the recipes in there are super quick, but you will need to re-design the 30-day meal plan yourself. Anyways, both books are great, you will just need to decide for yourself which suits you better. The 30-day Ketogenic Cleanse book is also packed with a lot of details on keto in general. Both beginners and advanced people will have a lot to learn from it. On top of that Maria Emmerich is very good at make things sound so simple. Her explanations are straight to the point all the time and easy to understand regardless of your background with keto or any other type of diet for that matter. A little bit on the downside of the book is that several readers reported that days 29 and 30 are missing from the printed version. The author took care of it by posting the missing day on the Facebook group she runs. The 30-day meal plan is accompanied by weekly shopping lists to make things super easy for everybody. Most of the ingredients used are reasonably priced and easy to find in the supermarkets, but based on here you live you might encounter difficulties in finding some of them. Nevertheless, there are plenty of recipes to choose from so you can easily make adjustments that suit you better from this point of view. There is no doubt that from a weight loss point of view, the Ketogenic diets work. There are hundreds of thousands of people if not more that are the living proof of that. Lowering your carb intake will make you drop a lot of body weight. Some of it might be just water weight, but for sure you will lose fat as well. The question that you need to ask your self is: Is this diet the right one for me? Allow us to help you with an answer to this question. Keto diets are great for the average sedentary people. They are also particularly good for people that have Type II diabetes, are overweight, have acne issues or insulin resistance. If you find yourself in any of these situations, keto dieting might be the best thing that could happen to you. On the other hand, if you are an active, healthy individual which puts a lot of effort into working out, your diet should be high in carb and protein. This is the exact opposite of what keto suggests, so make the decision based on your personal situation. 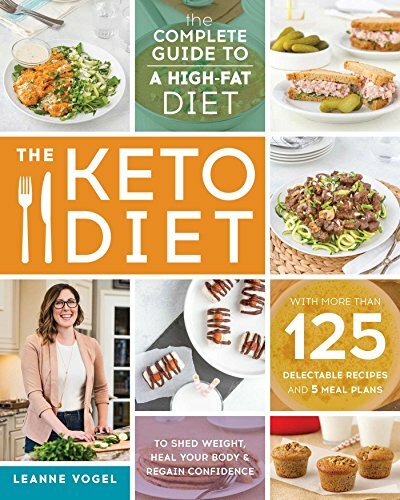 If you made the decision on following a keto diet, getting a ketogenic book will probably add more value to your knowledge, implementation and meal diversity. Which out of the 5 books presented above is the best though? You are the only one who can answer that. And there is no right or wrong answer. All of them are packed with great information, and can be of great value. You just need to pick the right one based on how in depth you want to learn about keto and how much time and effort you are willing to put into it.